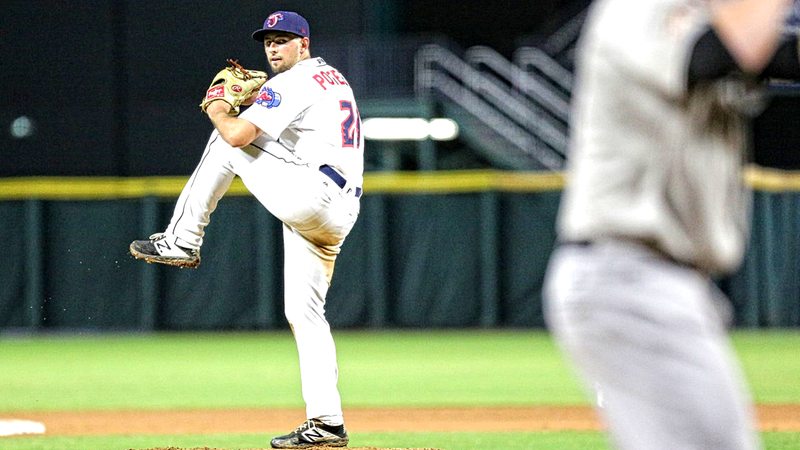 JACKSONVILLE, Fla. - Cody Poteet fired six scoreless innings Monday and a four-run Jacksonville second inning helped the Jumbo Shrimp to a 5-1 victory in the rubber match from the Baseball Grounds of Jacksonville. VyStar Credit Union members enjoyed buy-one, get-one-free ticket special at the box office and Jacksonville Sister Cities Association raised awareness and funds throughout the night. Poteet (1-0) struck out six over his six innings, ceding just three hits and two walks. Jeff Kinley and Brett Graves each followed with a scoreless inning out of the bullpen in Jacksonville's (3-2) victory. A four-run second inning turned out to be more than enough offense for the Jumbo Shrimp. Jackson (2-3) starter Riley Smith (0-1) walked Santiago Chavez to begin the frame before Bryson Brigman laced a double to put runners on second and third. Two batters later, Anfernee Seymour's RBI single scored the games first run. After a sacrifice bunt, Brian Miller plated a pair with a triple. Miller then scampered home on a wild pitch to make it 4-0. With the score still 4-0 in the fourth, Poteet singled with one out before a Miller base hit moved him to second. Joe Dunand then cashed in Poteet with an RBI double to make it 5-0. Jackson's lone offense came on a Jamie Westbrook home run in the ninth inning. Monday's winning raffle number of 1963150005 won a prize of $94. Following an off day Tuesday, the Jumbo Shrimp begin a five-game series at Pensacola with a 7:35 p.m. first pitch on Wednesday. Coverage begins at 7:20 p.m. on MiLB.tv, Sunny 102.3 FM, www.jaxshrimp.com and TuneIn.